• Bitter cold blasts Eastern U.S.: "First, Superstorm Sandy leveled his home and devastated most of his neighborhood in the New York City borough of Staten Island. 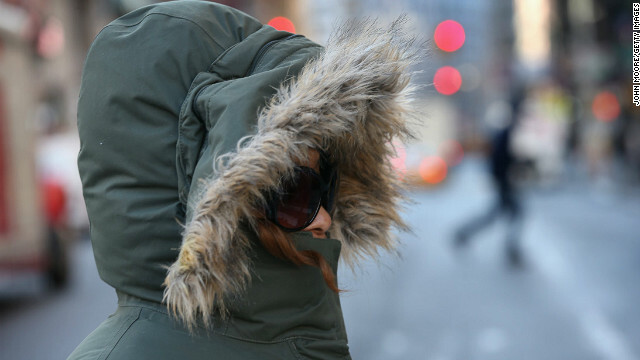 Now, an arctic blast that forecasters warn can have deadly consequences is gripping the region." • After threats against U.S., North Korea turns ire to South: "'Troubling and counterproductive' rhetoric from North Korea is inflaming tensions on the Korean peninsula, but ultimately, "we will judge North Korea by its actions, not its words," the U.S. envoy to North Korea said Friday." • Dozens injured in Cairo clashes as crowds mark Egypt protest anniversary: "The streets around Cairo's Tahrir Square were again roiled by violent clashes between police and protesters Friday, as crowds gathered to mark two years since the start of the revolution that ousted President Hosni Mubarak." • Bull market winding down. Don't panic: "With stocks at 5-year highs and the bull market entering its fifth year, questions about how much longer the bull has to run are beginning to swirl." • Mark Zuckerberg to fundraise for Chris Christie: "Facebook founder Mark Zuckerberg will host a fundraiser for New Jersey Republican Gov. Chris Christie's re-election bid, a Christie finance source confirmed Thursday." no coverage of march for life?????????? Does cnn approve killing innocent babies by ripping them into pieces! Shame on you cnn! He glibly spouts the precautionary principle – but would you pay say $2,000,000 insurance a year on a house worth $1,000,000. Thats what the Europeans are trying to do with disastrous results to the economies. I like his program in general – someone get him to take a serious look at reality and not regurgitate AL Gores fantasies.